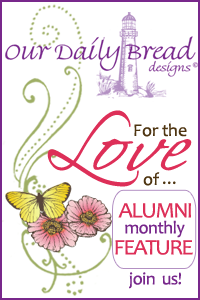 Welcome to Our Daily Bread Designs Alumni Team Monthy Feature Post. This month the Alumni Team is featuring projects created with Our Daily Bread Designs stamp sets that focus on Spring and New Life. I just love the smell of Lilac's in the Spring, and can't wait for mine to start blooming! My card combines the Lilac stamp from Our Daily Bread Designs, along with some newer stamps and dies from the March and April Releases. To create my card, I die cut and embossed the Quatrefoil Pattern Die from White card stock, then die cut that panel using the Quatrefoil Designs Die, as I only wanted to use a portion of the die to resemble "lattice". I die cut a "rim" from Black card stock, by die cutting both the Quatrefoil Designs Die and Offset panel at the same time; adhered the White Quatrefoil Pattern die cut to the rim panel, then attached it to an offest that was die cut from We R Memory Keepers pattern paper. This die stack was layered on a White panel that was stamped using the Romantic Floral Designs and die cut/embossed with Spellbinders Labels Twenty-Six, then layered on a Black panel die cut/embossed with Spellbinders Labels Twenty-Two then finally adhered to a White die cut/embossed panel using Spellbinders Labels Twenty-Six, then adhered to the card using dimensionals. The Lilac was stamped multiple times in Black Archival on White card stock; colored with STAEDTLER Karat Aquarell Watercolor Pencils, cut out and popped up on dimensionals, and adhered in place. The sentiment is from the Morning Glory set, stamped in Black Archival on White card stock. To frame the sentiment I stamped one of the Antique Label Designs images, and die cut/embossed it using the Antique Labels Designs and Border Die. To embellish, I added a Black Seam Binding Double Bow tied using Becca's Peg Bow Maker, and a few die cut butterflies. Thanks for stopping by! Our next ODBD Alumni Team Monthly Feature post will be on Thursday, May 9th! How pretty Lisa!! I love the colors, design with all those dies, and the coloring of the lilac!! Lovely Lilacs and beautiful card! How about if the weather stay warm enough for your lilacs to start blooming! :) Gorgeous card! i love d black in it ..!! Very pretty, love all the layers, and the lilac's...well, I almost can smell them! Love the bold black with the lavender/purple! Such a stunning card!